You are here: Home / Our Blog / Helpful Resources / What Is a PR or Title Commitment? What Is a PR or Title Commitment? When you buy a home, there is a lot of paperwork to review before all is said and done. 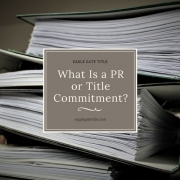 One of those documents is called the title commitment, also known as the preliminary title report (PR for short), title work, or title binder. In simplest terms, the St George title commitment is one of the most important documents that you’ll review before closing because it is the document that explains the title rights guarantee to your new property. It also represents the assurance that there are no defects in the property title and that you have the green light to obtain title insurance. A St George title commitment is typically issued in the following way. First, the buyer chooses a property. Next, a title commitment is ordered by the realtor. Once the St George title commitment is complete and it is confirmed that there are no defects in the property title, the title company (via regular mail) sends the buyer a copy prior to closing. Any exclusions, conditions, and terms found in a St George title commitment will also be reflected on the title insurance policy that the buyer will review prior to closing. Something important to remember about a St George title commitment is that, in most cases, you won’t have very much time to review it; probably a few days at most. Because it is time-sensitive in nature, it’s best to acquire some additional knowledge about it before you put your signature on it. Here are some things to consider. -A St George title commitment has five parts: what is not insured, specific title insurance requirements, what is being insured, the amount of insurance, and who is being insured (buyer and/or lender). Remember that the amount of insurance needs to cover the sales price and loan amount. -A St George title commitment, in addition to having the five parts mentioned above, is also broken down into two additional sections: Schedule A and Schedule B. Schedule A contains the loan amount, property price, seller/buyer information, and the commitment date – basically everything that the escrow officer receives from the title company. Schedule B contains the exceptions (CC&Rs) and is the most important part of a St George title commitment for buyers to read. -The exceptions found in Schedule B are extremely important for the buyer to be aware of. These include but are not limited to easements not shown in public records, encroachments, boundary issues, and right of parties in possession. Consider getting OEC as part of your title insurance policy as it will alleviate many standard exceptions. -Be meticulous about understanding the conditions. CC&Rs, for example can be bundled in to a St George title commitment. This should be of particular interest to buyers purchasing property in a subdivision or gated community. Be sure you are okay with all conditions that you will be required to adhere to. -Getting things in writing is not just a suggestion, it’s a necessity. Any problems or concerns that you have about the property, the St George title commitment, or anything else needs to given to your realtor and presented in writing immediately. That way the realtor can efficiently give this information to the seller. The seller will have a contractually obligated amount of time to review and respond. When the buyer is organized and has everything in writing, the process leading toward the completion of a St George title commitment will be much smoother. If you have any additional questions about St George title commitments, contact a representative at Eagle Gate Title and we would be happy to help you no matter what your circumstance may be. http://eaglegatetitle.com/wp-content/uploads/2019/02/st-george-title-commitment.jpg 500 500 aloha http://eaglegatetitle.com/wp-content/uploads/2019/02/logo-300x212.png aloha2019-02-26 16:56:492019-02-27 19:37:31What Is a PR or Title Commitment?